Protesters who oppose the proposed Keystone XL pipeline gathered near the SFJazz Center, where President Barack Obama made a fundraising appearance Monday afternoon. President Barack Obama visited San Francisco today where he made a speech on immigration reform and attended two fundraisers at the SFJazz Center and the home of Salesforce.com CEO Marc Benioff. Air Force One arrived at San Francisco International Airport shortly after 10:30 a.m. today. The president was greeted on the tarmac by U.S. Sen. Dianne Feinstein before stepping into a black SUV and being driven to the Betty Ong Recreation Center in the heart of San Francisco’s Chinatown. There, the president addressed a crowd of ticketed guests that included members of the Board of Supervisors, the heads of several city agencies and former mayor and current California Lt. Gov. Gavin Newsom. The president said he wants to see Congress pass such a bill by the end of the year. He called for reform that includes a path to citizenship for the country’s estimated 11 million undocumented residents and measures to strengthen border security. “The only thing standing in the way is the unwillingness of certain Republicans,” he said. GOP leaders in the House of Representatives have so far blocked consideration of a bipartisan Senate bill that would overhaul the nation’s immigration system. Obama touted the economic benefits he said the United States would see if the Senate bill became law, saying the economy would grow by $1.4 trillion over the next 20 years. “It would boost our economy and shrink our deficits,” he said. “You don’t have to be an economist to figure out our workers will be more productive” without the worry of deportation or being separated from family members. Obama said he is willing to help push along the bill in smaller chunks if that will appease Republicans. He acknowledged the large Asian population in San Francisco and throughout the Bay Area, and the risks many immigrants face in coming to America. “Too often when we talk about immigration our focus is on the southern border,” Obama said. In the beginning of his remarks, the president also gave a nod to 5-year-old Miles Scott, a cancer patient whose leukemia is in remission and who became “Batkid” for a day on Nov. 15 as part of the now-famous Make-a-Wish foundation event in his honor. “I love San Francisco. You got great food, you got great people, beautiful scenery—no more super villains because Batkid cleaned up the streets,” Obama said. The Betty Ong Recreation Center is named for an American Airlines flight attendant who was on Flight 11, the first plane to crash into the World Trade Center on Sept. 11, 2011. Obama noted that Ong, a San Francisco native, was the daughter of immigrants and that some of Ong’s family members were in attendance today. From Chinatown, the president headed to the new SFJazz Center in the city’s Hayes Valley neighborhood to meet with supporters for a fundraiser for the Democratic National Committee. 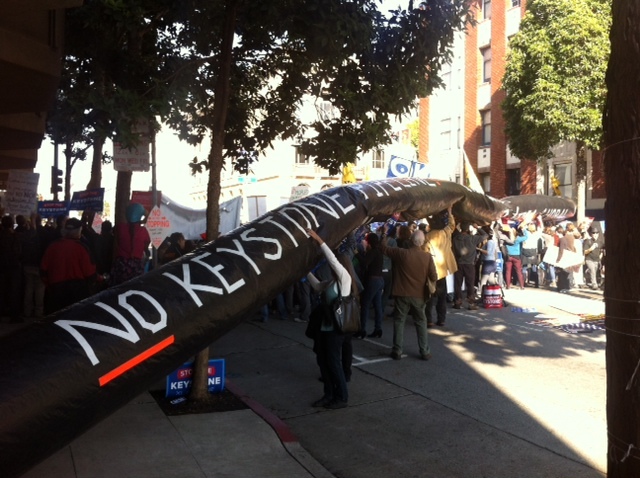 Protesters gathered near the jazz center, chanting and carrying signs—including more than 100 people who stood at Franklin and Fell streets holding a fake pipeline over their heads that stretched across Franklin Street to symbolize the proposed Keystone XL pipeline, which they said would harm the environment and accelerate climate change. Marx said the pipeline would result in increased production at the tar sands and would lead to widespread deforestation and the leaking of hazardous materials into water supplies. He said protests like today’s “have made it politically tricky” for the president to support the project since it could antagonize environmentalists in the Democratic Party. Other protesters shouted into megaphones about the Obama administration’s use of drone strikes on military targets overseas. Stephanie Tang, an organizer with the group World Can’t Wait, was among a group that gathered at Fell Street and Van Ness Avenue, a block east of the jazz center. Tang said the drones “have been sold to the American people as a new kind of surgical tool” for the military, but that the strikes have caused widespread deaths of innocent people. Although a majority of the protesters came out for the pipeline or drone causes, others held signs urging the president to push for single-payer health care or to cut government’s ties to large corporations. After his appearance at the jazz center, the president attended the fundraiser at Benioff’s home before heading off to Los Angeles. The visits are part of a three-day West Coast fundraising trip that included a stop in Seattle on Sunday. Air Force One departed from SFO for Southern California shortly after 4:30 p.m.